Victor Braunig Lake (formerly known as East Lake) is located about fifteen miles southeast of San Antonio in Bexar County, on Arroyo Seco, a tributary of the San Antonio River. The Lake is owned and managed by CPS Energy of San Antonio (City Public Service) for cooling to a complex of power plants and recreational purposes. Authorization (Water Right Permit No. 1990) was issued by the State Board of Water Engineers on August 21, 1961. Victor Braunig Lake is a reservoir on Calaveras Creek and Chupaderas Creek 17 miles (27 kilometers) south of Downtown San Antonio, Texas, USA. The reservoir was formed in 1962 by the construction of a dam to provide a cooling pond for a power plant to supply additional electrical supply to the city of San Antonio. 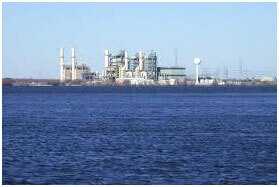 Together with Calaveras Lake, Braunig Lake was one of the first projects in the nation to use treated wastewater for power plant cooling. The reservoir is partly filled with wastewater that has undergone both primary and secondary treatment at a San Antonio Water System treatment plant. Braunig Lake also serves as a venue for recreation, including fishing and boating. Construction of the dam started on June 6, 1961 and was completed in December 1962. Deliberate impoundment of water began when pumping from the San Antonio River began soon after. Power generation started in April 1966.